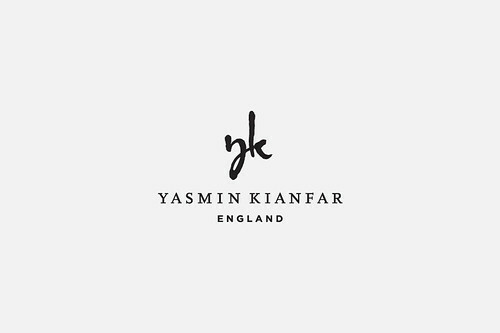 Yasmin approached me a few weeks ago to see if I would be willing to take on a relatively urgent project, to create her fashion identity brand by Christmas. Yasmin is a promising young English fashion designer, already featured in many publications and has her first range coming out next year. What you see here is the first of a few ideas for the main logo presented to her. The image above was created using one of her actual photographs from her website. I then mocked-up what could be a poster or a magazine advert or even a big display sign for a fashion shop with the logo. Below is the main logo created for her. I made a number of changes to the YK mark, opened up the bowl in the ‘y’, thinned out the general weight of the letters and created a more noticeable slope down to the right on the baseline. The baseline of the ‘y’ slopes down to the base line of the ‘k’. Some subtle spacing changes in the main wording, as well as changing font for the tag line. So far, Yasmin has not requested a tag line, so my ‘England/London’ is just as a placeholder, but I have recommended to her that something is required, at least for the main brand ID. It needn’t be used all the time. As you can see from my page mock-ups, I have also created a contained version of the initials reversed out of black, there could also be a white box version for dark backgrounds, so it’s a flexible mark. Fashion designer brands are typically typographic in nature, strong focus on type, with a few designers opting for a mark of sorts. Yasmin wanted her initials as a way to help strengthen awareness with her full name, especially when used to brand clothing etc. We looked at a number of competing brands to gauge which style of typefaces were most common, then I looked to find a font that was relatively unique, but still fitting of a fashion designer. Above is a quick mock-up to show her just how some business cards could look with the logo in place. I opted to retaining this sense of space and keeping all elements quite small. The focus is on her brand ID whilst the contact information is placed bottom corner. Yasmin is launching a range of sunglasses in the new year, but as I had no imagery for these, or even examples of styles, I had to find some images on line. It was important to show Yasmin how the logo would look and work on a typical range of sunglass packaging. Putting the ID in context for something like this is very important. Especially if you want your client to be able to make an informed decision, be it yes or no. We didn’t have lots of time to spend mocking up super realistic presentations, so I used what was available to me and emailed her these images. Images like this say a lot about how a logo will work in context. This last image is how I planned the initial mark to be used on the actual arm of the glasses. This image is small, but the idea is that the initials will be formed from a thick material, cut out in the exact shape and placed in position. So no big or lumpy badges, just the initials raised a few mm’s off the arm. For thinner arms we could print the logo, or any other method to maintain a visible brand mark. Oakley sunglasses are good examples.